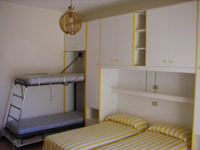 with two single beds and a folding-down bunkbed. Cooking facilities complete with fridge, saucepans and cutlery. Bathroom with shower and hot and cold water. On the 1st floor there is air conditioning and heating for payment. Numbers 2-3-5-7-9 have a new big terrace with table and chairs. Reserved parking place around the building. Poker 22-23 do not have balcony. All linen is not included in the price.